Jess Wells is the author of four novels, five books of short stories, and anthologies of fiction and social commentary. 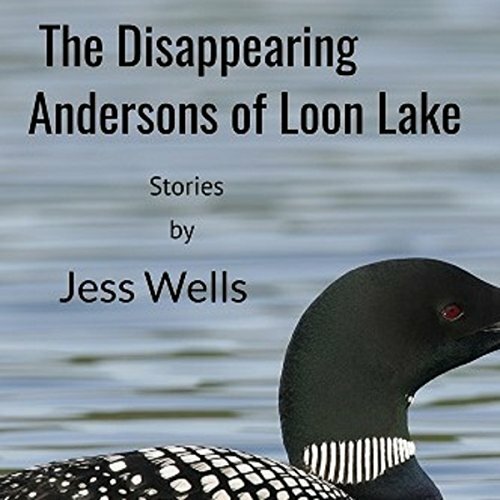 Her latest work, "The Disappearing Andersons of Loon Lake" is an audio book narrated by the author. She is a recipient of a San Francisco Arts Commission Grant for Literature and a four-time finalist for the Lambda Literary Award. Her short stories have been included in more than three dozen literary anthologies. Jess teaches workshops at writing conferences and art centers on "How to Write Historical Fiction" and other topics. Love, loss, irony and humor abound in the lives of eight families living around Loon Lake, a shallow fishing spot in Northern Michigan. Wells' "use of language is like music," critics says, while others call her writing "a rich and varied drug," and these stories convey "a real sense of the contradiction and the ambivalence that goes on within the family circle...through writing that has a lyrical style." Whether it's the story of a young dreamer and a bully, a man looking forward to retirement and the family that stands in his way; a teacher facing ethical choices, or a family coping with disaster, these stories delight. "A Slender Tether" set amid the turbulent weather of Europe's Little Ice Age, offers three compelling tales of self-discovery, woven into a rich tapestry of 14th century France. Christine de Pizan, daughter of a disgraced court physician and astrologer, grapples with her ambition to be the first woman writer in France. A doctor finds an unusual way to cope with the death of his wife. And opportunity alternates with disasters in the lives of four commoners, yoked by necessity: a paper-maker struggling to keep his business, a falconer with a mysterious past, a merchant's daughter frantic to avoid an arranged marriage, and a down-on-his-luck musician with a broken guitar and the voice of an angel. "The Mandrake Broom", dramatizes the fight to save medical knowledge during the witch-burning times in Europe 1465-1540.